Posted on March 21, 2017 at 3:46 pm. 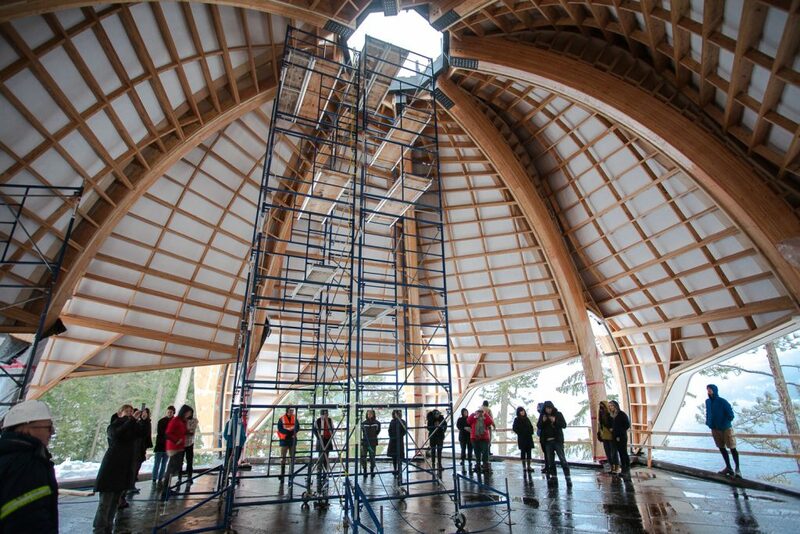 World-renowned Patkau Architects brought the entire Vancouver office to view their current project, the Temple of Light, at Yasodhara Ashram last weekend. The visiting architects agreed that the shore of Kootenay Lake is a “monumental’ setting for the innovative new structure. Patkau Architects has an international reputation for design excellence and has received dozens of national and international architectural awards. Their style allows the setting of a project to inform its design. Canadian design magazine Azure recently honoured principal architect Patricia Patkau as one of 30 must-know women architects around the world. “This project has been extremely challenging for the architect team and consultants. Everyone has been stretching to their limits. Every participant – from the architects, designers and now builders – has risen to the challenge,” says Patkau. Nelson manufacturer Spearhead Inc. – one of only a few companies with the specific technology required for this unique project – manufactured the complex prefabricated components of the lotus-shaped building. Many local contractors are also contributing. Burnaby’s Alfred Horie Construction Group is managing the on-site building of the Temple, engaging carpenters from the region. “The Ashram community is watching joyfully as the new Temple of Light takes shape. We are delighted to be creating sacred space open to all traditions, ethnicities and genders. And we are enthusiastic that the construction and design has expanded the boundaries of architecture,” says Yasodhara Ashram president, Swami Lalitananda. The Temple of Light will be complete this summer. Yasodhara Ashram’s annual Strawberry Social on June 24 will invite the local community together to celebrate and tour the new Temple. Drop-in visitors are welcome anytime and the Taste of the Ashram program offers an introduction to the Ashram with yoga class, lunch and tour.